A still image from dashcam footage of the meteor. Residents of southeast Michigan were startled Tuesday night when a bright flash lit up the sky, accompanied by a loud boom and subsequent shaking. 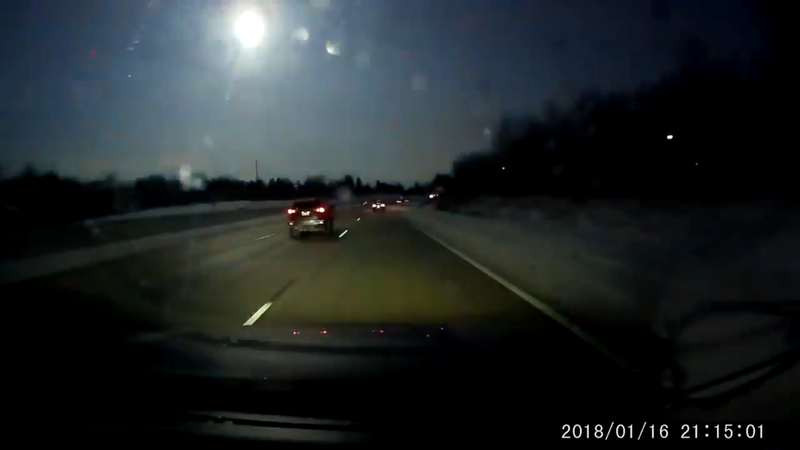 Dash cam footage from the event shows a fireball streak downward before burning out. NASA was able to explain the phenomenon as a meteor. Bill Cooke, lead for NASA’s Meteoroid Environment Office at the Marshall Space Flight Center in Alabama, said the fireball was caused by a one-to-two yard asteroid entering the atmosphere at approximately 28,000 mph. A minor earthquake caused by the celestial object was recorded by the United States Geological Survey, who said the magnitude 2.0 quake was centered about five miles west-southwest of New Haven--around 40 miles northeast of Detroit. The National Weather Service confirmed in a tweet that the phenomenon was likely caused by a meteor. The meteor was visible in six states and Canada, according to the American Meteor Society's report map, featured below.